Nuclear War Now! Productions :: View topic - DEAD CENTER Prods - store etc. ANNIVERSARY sale! DEAD CENTER Prods - store etc. ANNIVERSARY sale! 2) to have discount your order should be no less than 20 USD/EUR. + protection hard paper, tape and etc. PLEASE note! Each CD's weight is different, you know, one comes with 4 pages booklet, other with 28 pages booklet, and other DigiCD at all. Do you take paypal?? your title says yes but can't find it on the checkout page. I assume I just place order and you'll send total via email or paypal? Yes, because prices aren't including postage rates. You might choose any of listed ways there on checkout page, and write in order comment box what the way of payment would you use. 5 days of 20% discounts left! 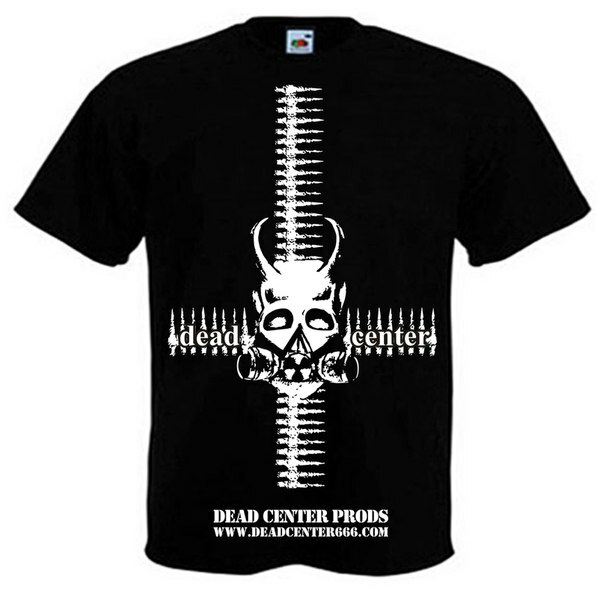 Official DEAD CENTER Prods T-Shirt. Ltd to 100 copies. All sizes are available, both male and female! One shirt costs - 19 USD + postage. As always - many items, low prices and fastest deliery! Posted: Fri Sep 28, 2012 6:48 am Post subject: Weekend discounts! ATTENTION! Since 28-09-12 until 02-10-12 there will be next discounts for ALL items (except of clothes) at the store - for orders up to 10 USD - 10% discount, for orders from 20 USD - 20% discount. And hellish proposal! - for all the orders start from 300 USD - 30% disount! * the prices at the shop aren't changed, so you must just add needed items to the basket (or send us through e-mail in text format) and we'll minus percents and will send you complete sum including postage rates. Posted: Mon Oct 01, 2012 10:06 pm Post subject: Re: Weekend discounts! Today is the last day of discount sales! Did not find an email address on the shop, where should i send my mail to? Updated catalogue is attached with Xls file. Discount system is working only for those customers who make orders using store's shopping cart! Even if you have already discount - you must make your orders using shopping cart. Just to remember how discounts system working - when complete sum of your orders will reach 50 EUR - you'll get 5% discount for ALL your future orders, and when complete sum of all your orders will reach 100 EUR - you'll get 10% discount for ALL your future orders!